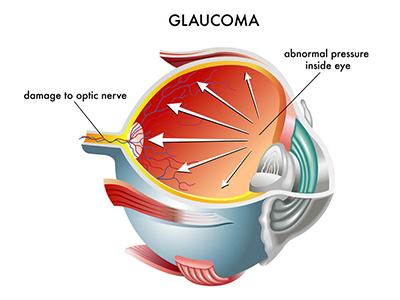 Glaucoma is an eye disease that affects the optic nerve and eventually can damage it if not treated early. The optic nerve is what sends visual messages to the brain and without this, vision can be impaired. Glaucoma often does not have any symptoms that are noticeable until the disease has progressed. A routine eye examination can help diagnosis glaucoma early before permanent damage is done to the optic nerve. In the early stages of the disease, there are no symptoms. As glaucoma progresses, a person may notice problems with side vision. By the time a person notices anything however, there will have been a great deal of damage to the optic nerve. The side vision or peripheral vision will slowly develop blind spots which get bigger as the disease progresses. Eventually the center vision will be involved where central vision loss will occur and eventual blindness will ensue. The goal of glaucoma management is to catch persons before any vision has been lost. This is accomplished by routine and comprehensive eye exams. Glaucoma is divided into two broad categories based on the anatomy of the angle where the trabecular meshwork is found. They are open-angle and closed-angle. Best correctable vision is ascertained. The eye pressure or intraocular pressure is measured. Pachymetry or corneal thickness is measured. This is an important measurement which must be done for more accurate eye pressure evaluation. The eye is dilated to assess the most important structure in glaucoma detection the optic nerve. The nerve is carefully examined to determine if any abnormality or suspicion of abnormality is present. In addition, the retina and macula (the central part of the retina) are examined as well. Visual field testing is done in order to measure the side vision of the eye. As described earlier, glaucoma initially affects the side vision so assessing this area of vision is crucial. Computerized optic nerve imaging. There are several devices currently available to assess the optic nerve. They are the Heidelberg, the GDx and the OCT. Each of these uses a different method to evaluate the optic nerve. This information is helpful because they are a separate and independent tool to further assess the optic nerve. If you or a loved one is at risk for developing glaucoma, we urge you to contact us as soon as possible for a simple glaucoma screening. Glaucoma testing is a preventative measure that can help preserve your precious eyesight! Glaucoma, often called the silent thief of sight, is a disease of the optic nerve which has little or no symptoms. The eye needs a healthy optic nerve in order for a person to see. It is the optic nerve that relays images and information to the brain. If the disease is not caught and treated in time, blindness may occur due to optic nerve damage. It is estimated that up to half the people affected with glaucoma are unaware of it. However, it is easily diagnosed with a routine ophthalmic exam. Glaucoma as of yet, has no cure and loss of vision cannot be reversed. Treatment of the disease can and will stop it from progressing. Since this is a chronic disease, monitoring must be maintained for life. To learn more about glaucoma, click on the links below.